Home > Services > Arthroscopy is a procedure that orthopaedic surgeons use to inspect, diagnose, and repair problems inside a joint. The word arthroscopy comes from two Greek words, "arthro" (joint) and "skopein" (to look). The term literally means "to look within the joint." During shoulder arthroscopy, your surgeon inserts a small camera, called an arthroscope, into your shoulder joint. The camera displays pictures on a television screen, and your surgeon uses these images to guide miniature surgical instruments. Arthroscopy is a procedure that orthopaedic surgeons use to inspect, diagnose, and repair problems inside a joint. The word arthroscopy comes from two Greek words, "arthro" (joint) and "skopein" (to look). The term literally means "to look within the joint." 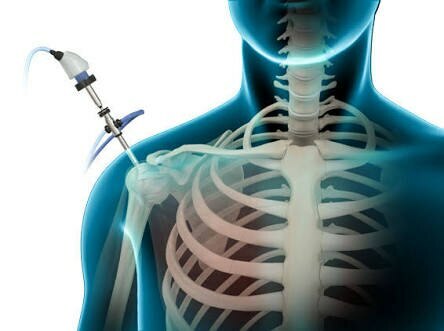 During shoulder arthroscopy, your surgeon inserts a small camera, called an arthroscope, into your shoulder joint. The camera displays pictures on a television screen, and your surgeon uses these images to guide miniature surgical instruments.